This mod is singleplayer only, it provides much larger and intense campaign battles. Campaigns have been modified in such a way that the attacking side in each campaign will have a strong advantage be it larger numbers or stronger technological advantage over the defending side. One of the goals of this mod was to provide a stronger focus on combined arms operations in both defense and offense. The other goal was to provide an overwhelmingly superior USA in bluefor campaigns, in terms of skill and technology. 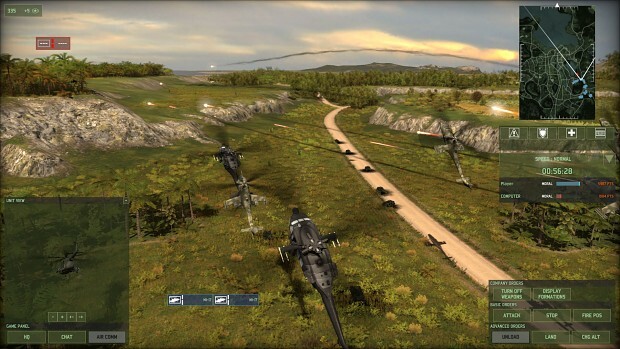 This mod introduces several bluefor and redfor units that were only available in skirmish and not in campaign (such as the Apache helo), as well as several countries that werent included. Examples include: East German specialist units in Climb Mt. Narodnaia, US airplanes in Bear Vs Dragon and Pearl of the Orient, as well as eastern block former warsaw countries and Scandinavian countries in the Second Korean war.